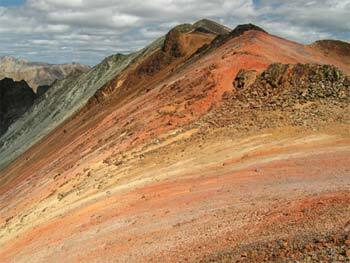 Geologically speaking, the first things noticed by most visitors to the Southern Chilcotin Mountains (SCM) are the unusual mix of rugged and smooth terrain as well the montage of color. 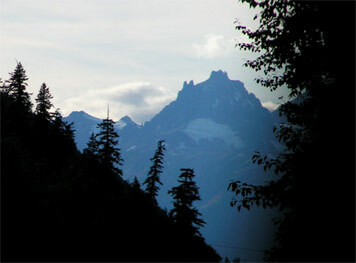 In close proximity, pyramid shaped mountains such as Mt. Vic rest near to smoothened earthy ridges like “Sheba Ridge” and plane-like features such as the Dil-Dil Plateau. 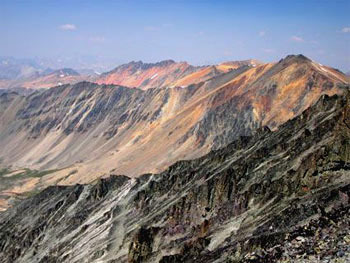 Upper Warner Ridge, with its fine collection of geologic color, is one example of South Chilcotins coloration. Plate tectonics play a huge part in the geological history of the South Chilcotin. For hundreds of millions of years, land mass and oceanic crust have been scraped off onto the North American continent. Today, beneath the Pacific Ocean the oceanic crust continues to dive and scrape below this continent. These segments of scraped off rocks and sediments, called terrains, accumulated to extend the west coast of N. America west to where it lies today. 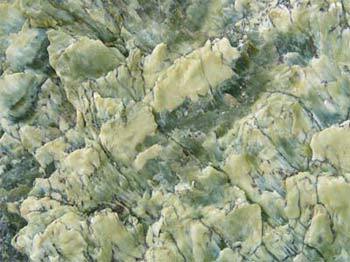 Some terrains are composed of many different types of rocks. One example of the geologic complexity of this region is the small area of upper Taylor which is believed to be generally comprised of 2 different terrains plus plutonic rock (igneous intrusive) comprising at least 19 different types of rocks! 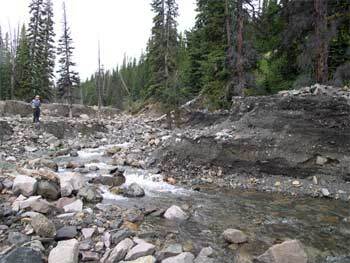 Debris flows are a hazard in the South Chilcotin Mountains. 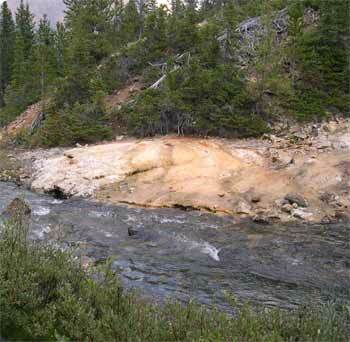 This event completely blocked Paradise Creek temporarily and left deposits up to 3m deep. Over time, the numerous terrains of this region deformed, moved along faults, folded and rose up to become mountains. 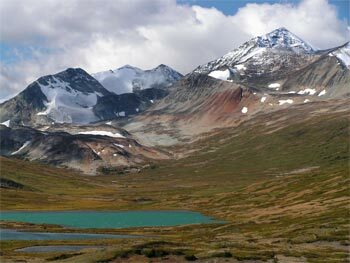 Later volcanic activity, glaciation and general erosion further shaped these mountains. One extremely useful tool in deciphering the complex geology of the South Chilcotins is the presence of fossils here. 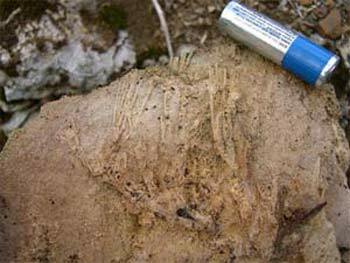 Many of the rock types found in the Southern Chilcotin Mountains are sedimentary and contain fossils specific to the rocks origin. 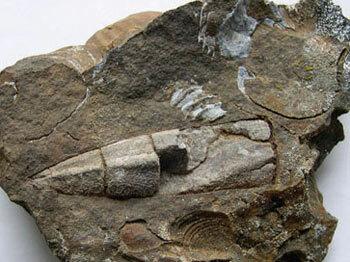 So by studying the fossils, much information can be gained about the rocks they reside in. 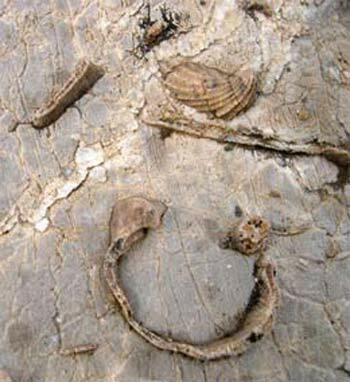 An incredible variety of fossils have been identified in the South Chilcotin. These include: radiolarian, conodonts, plants, ammonites, bivalves, belemnites, gastropods, nautiloids, scaphopods and sponges. For most of these fossil types, several species have been identified. 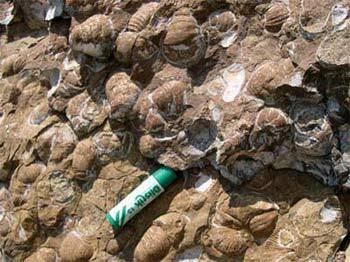 The overall age range of these fossils is approximately 90-250 million years so some of these creatures lived during the time of the dinosaurs! 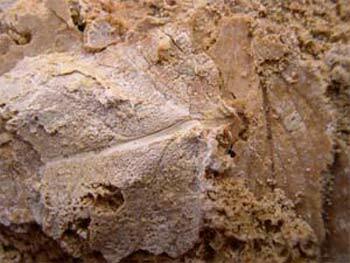 Most of these fossilized creatures existed in a marine environment. 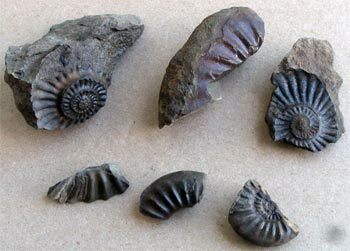 Some fossils like the bi-valves can be found in beds (outcrops) more than 1,000 m thick, while other types like belemnites or ammonites mainly exist as fragments on the grounds surface. Others, such as sponges, can be found protruding from weathered limestone rock. 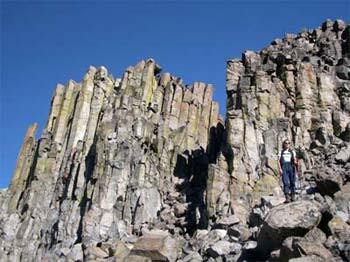 Hexagonal shaped basalt columns are formed in lava flows which cool slowly. Lava flows once covered large parts of the N portion of the map area and are an extension of the vast Chilcotin Plateau to the N. Oddly enough, remnants of these lava flows can be found today at the top of Tepee Mtn, Relay Mtn, Cardtable Mtn, Castle Peak; and along the sides of “Sheba Ridge”, Fortress Ridge and the Dil-Dil Plateau. White volcanic ash, called tephra, is abundant in the SE corner of the map area. This ash, called the Bridge River Tephra, is believed to have erupted from Mt Meager about 2,300 years ago, which was the most recent volcanic eruption in SW BC. The ash was deposited in the SE portion of the South Chilcotins and beyond to the E by the prevailing winds. We have found some ash pieces being 3-4 cm in diameter but most of this ash is granular and loose existing in beds up to 0.5 m thick at surface or just below the soil. This ash can be easily identified in upper Taylor and Pearson basins, lower Gun Creek, lower North Cinnabar Trail/Route, and around Pearson Pond and Mowson Pond. In W portion of map area it is likely that ash from other volcanoes exists here – but deeper down and in thinner beds. Mt. 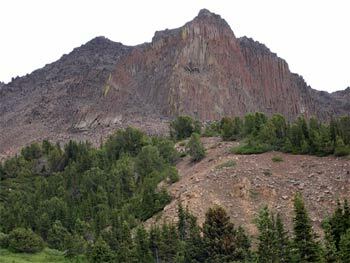 Mazama, a stratavolcano, erupted about 6,800 years ago from a volcano in SW Oregon and the ash was forced NE to cover a wide area including the SE portion of the Southern Chilcotin Mountains. This volcano eventually collapsed to produce Crater Lake, one of the world’s best known calderas. Odd shaped and sometimes colorful glendonite-related concretions (pseudomorph after ikaite) are common in some parts of the map area. 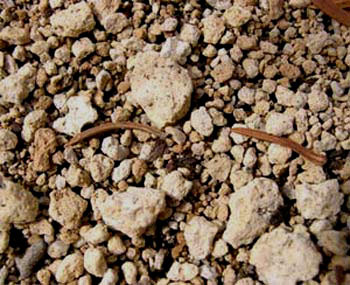 These nodules of sedimentary rock, usually <4 cm diameter, form in a marine environment when cementing minerals (usually carbonate or silica) fill a void within the sediments. 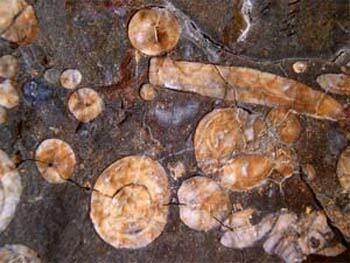 It is thought that concretions form around a nucleus of organic material (i.e. tooth, leaf, shell fragment). Some concretions from the map area are elongated (cylindrical) with a square hole down the center – what could have been the nucleus? Colors range from grey to brown to reddish to black. 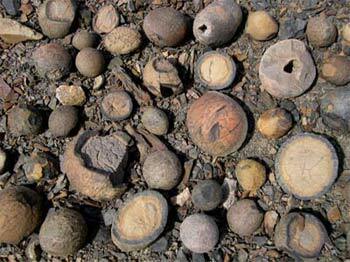 Many of these concretions are round or ovoid. 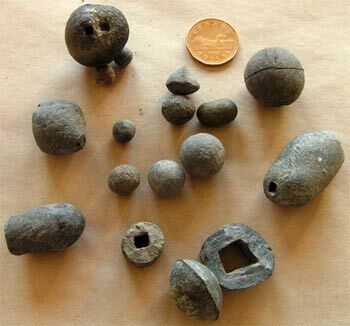 Look for concretions near the Castle Pass, “Relay-Cunningham Ridge”, “Little Graveyard Pass”, and Tyoax Pass areas. Tufa deposits form when spring water with a high concentration of calcium carbonate reaches the surface. The calcium carbonate then precipitates out to form a porous grey/brown heap of rock. There are 2 tufa deposits in lower Lizard Creek valley right alongside the trail (and Lizard Creek). Geodes are rock cavities containing crystal formations. The host rock is often limestone. Some geodes have been found in the Castle Pass area. – Garver, John, I., Schiarizza, P., and Gaba, R.G. – Nasmith, H., Mathews, W.H. and Rouse, G.E. – Schiarizza, P., Glover, J.K., and Garver, J.I.